In this video, we will learn about, creating stored procedures with output parameters. Please watch Part 18 of this video series, before watching this video. To create an SP with output parameter, we use the keywords OUT or OUTPUT. @EmployeeCount is an OUTPUT parameter. Notice, it is specified with OUTPUT keyword. 1. First initialise a variable of the same datatype as that of the output parameter. We have declared @EmployeeTotal integer variable. 2. Then pass the @EmployeeTotal variable to the SP. You have to specify the OUTPUT keyword. If you don't specify the OUTPUT keyword, the variable will be NULL. If you don't specify the OUTPUT keyword, when executing the stored procedure, the @EmployeeTotal variable will be NULL. Here, we have not specified OUTPUT keyword. When you execute, you will see '@EmployeeTotal is null' printed. You can pass parameters in any order, when you use the parameter names. Here, we are first passing the OUTPUT parameter and then the input @Gender parameter. The following system stored procedures, are extremely useful when working procedures. sp_help SP_Name : View the information about the stored procedure, like parameter names, their datatypes etc. sp_help can be used with any database object, like tables, views, SP's, triggers etc. Alternatively, you can also press ALT+F1, when the name of the object is highlighted. sp_depends SP_Name : View the dependencies of the stored procedure. This system SP is very useful, especially if you want to check, if there are any stored procedures that are referencing a table that you are abput to drop. sp_depends can also be used with other database objects like table etc. Note: All parameter and variable names in SQL server, need to have the @symbol. 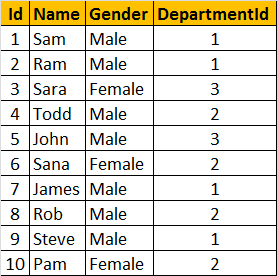 Anyone knows who to create a procedure where the table name is also a parameter. I wrote a small procedure but could find a way to print the results yet.